Wow!!!! Thanks for all the sweet comments about my cubical. Wouldn't you know that just last week, I was moved into a private office! I am enjoying a whole new space to decorate. I'll post photos when I am finished. And speaking of finishing, I wanted to share a photo of my latest finished Storybook Doll. Meet Little Bo Peep! Little Bo Peep has a head, arms and legs sculpted from paper clay. The paper clay pieces go through a 4 step painting process, which gives the colors a nice glow, I think. Her body was fashioned from a wire armature that is first wrapped in paper tape, then wrapped with natural cotton batting. Over that, I built her costume using both vintage and new fabrics. At her feet are millinery flowers and just enough glass glitter to make her sparkle, just a wee bit. 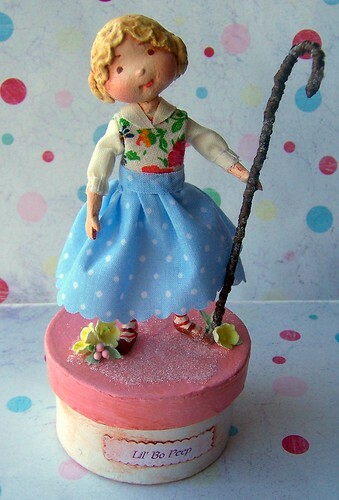 Little Bo Peep in the 3rd in the series of Storybook inspired dolls and are available on PFATT Marketplace on the 10th of each month. Here's a link to my page. Finally, I apologize in advance that, in preparation of many exciting events forthcoming, I'll be posting pretty infrequently over the next few weeks. One of those events I'll have to wait a bit before announcing, but I am really excited to share once I have some confirmation. Another event which is consuming my spare moments is preparing for the Art, Paperie and Pleasantries show happening in less than 2 months! I am teaching a mini workshop and will have a vendor tabe at the event so I need to dig in my heels and get some studio time in for sure. Happy March everyone! Spring is coming!!! !